The operator of the crippled Fukushima Daiichi power plant started removing nuclear fuel from a storage pool Monday at one of the reactor buildings damaged by hydrogen explosions in the 2011 disaster triggered by an earthquake and tsunami. It is the first fuel removal operation by Tokyo Electric Power Company Holdings Inc. from the storage pools of the Nos. 1 to 3 units, which suffered meltdowns after losing power due to the calamity. The start of the work was delayed by more than four years due to a series of malfunctions of the devices necessary for the operation and high-level radiation observed in the area posing a challenge, according to the operator. TEPCO said it plans to take out seven unspent fuel rods from the reactor's pool, where a total of 566 spent and unspent fuel rods are stored, and transfer them to another storage pool on the premises later this month. The work is planned to complete by the end of March 2021. There are a total of 1,573 fuel rods including unspent ones inside the storage pools of Nos. 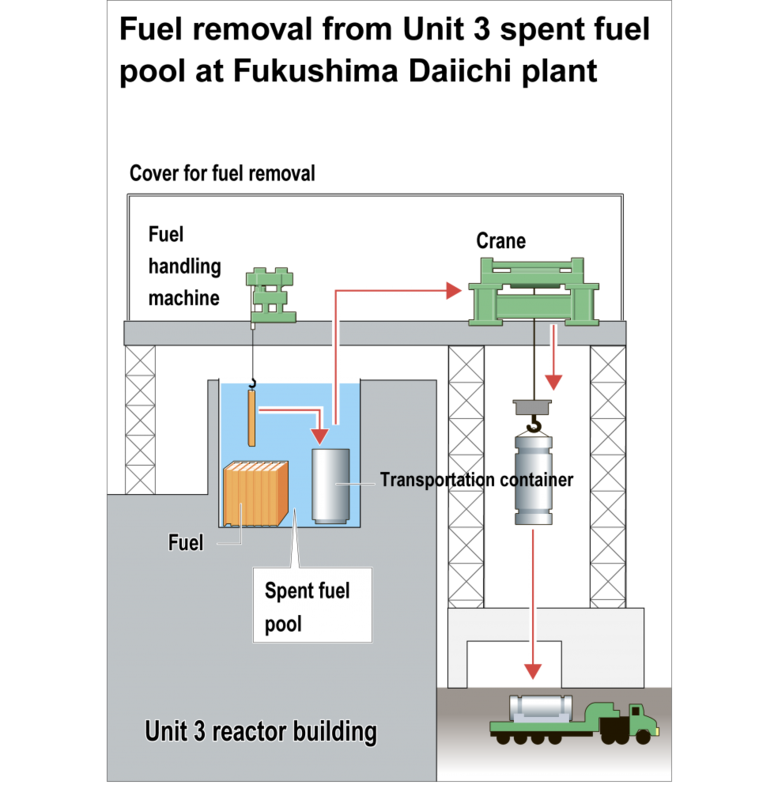 1 to 3 units, and the large amount of spent fuel is a huge obstacle to scrapping the crippled reactors as they generate heat and high-levels of radiation for a long time. After removing the seven unspent fuel rods that pose a relatively low risk, removal work will step up a level possibly in June as the storage pool to which the fuel will be transferred goes under a regular checkup required by law. The fuel removal was originally scheduled to start in late 2014 but was pushed back multiple times. 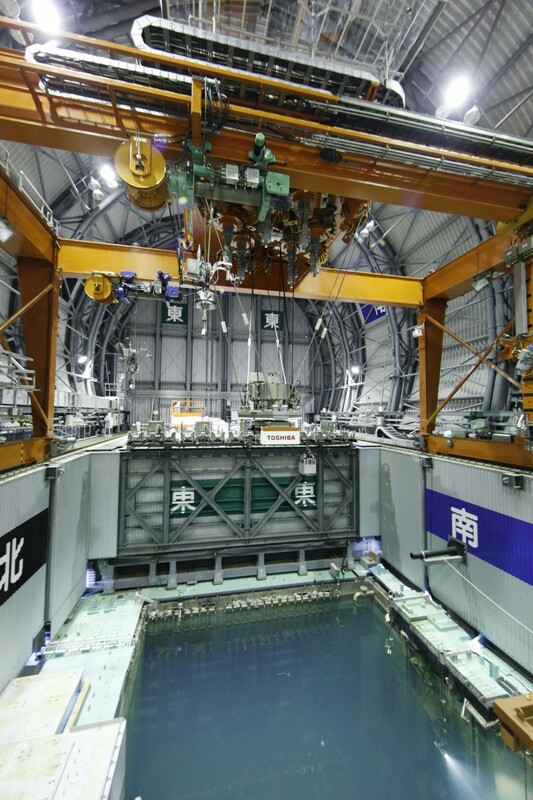 In 2014, TEPCO completed fuel removal work at the pool of the No. 4 unit, which was offline for regular checkups at the time of the accident and had all of its fuel stored in the pool. Unlike the Nos. 1 to 3 units, it did not suffer a meltdown. The utility said it aims to start in fiscal 2023 the fuel removal work at the pools of Nos. 1-2 units and has been assessing their surroundings. Among the Nos. 1 to 6 units of the Fukushima Daiichi power plant, the reactor buildings of Nos. 1, 3 and 4 units suffered hydrogen explosions following the disaster.